Happy Needle and Thread Thursday, y'all! 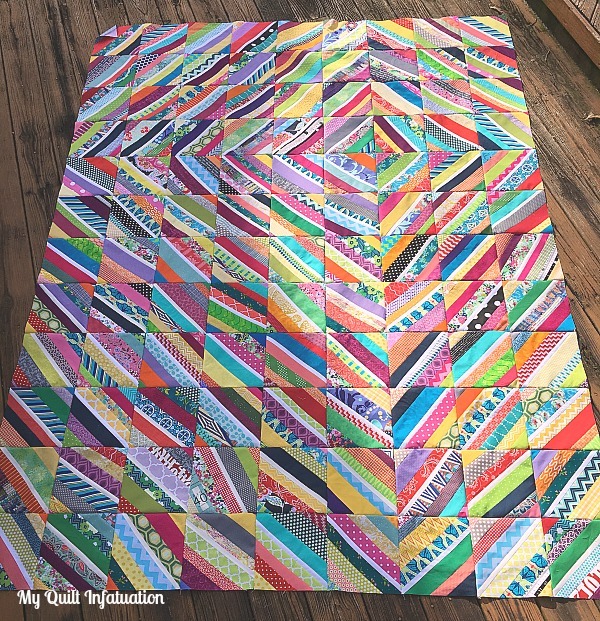 My latest quilt top is made from a scrap jar dive, and it's a doozie. It's loud and wonky, and I love it! 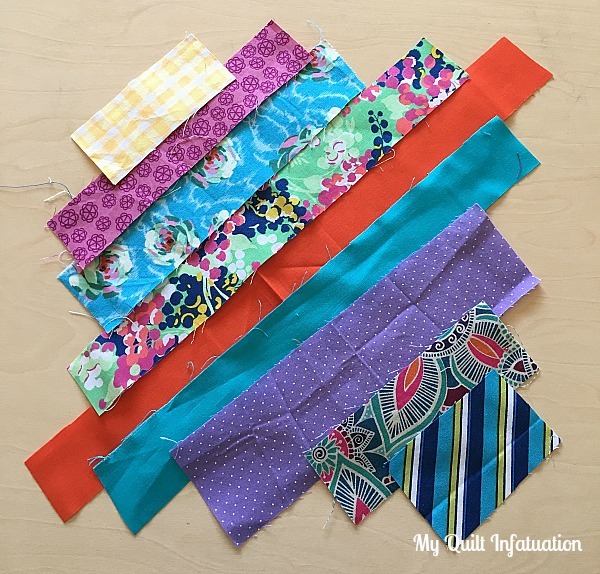 It's amazing how quickly scraps add up when you start sewing them together. When I started, I didn't plan on making a quilt this large, but the my pile of strings didn't diminish as quickly as I anticipated. 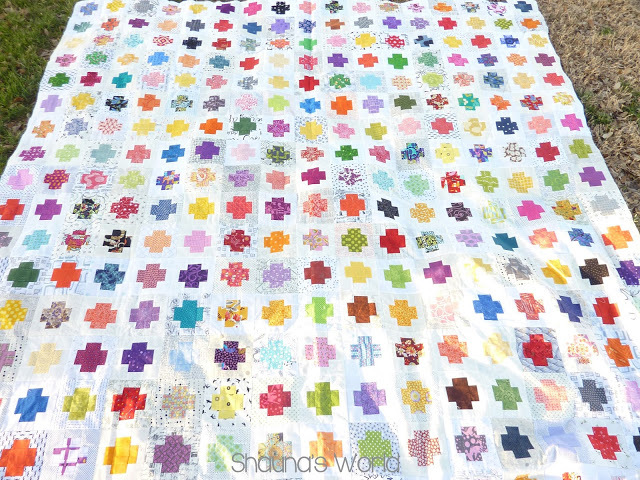 This quilt measures 72" x 96," and although I used all of my strings long enough to cover the length of the center of the block. I still have LOTS of shorter ones left. Every now and then, I get on a mission to get rid of all of my scraps at once. 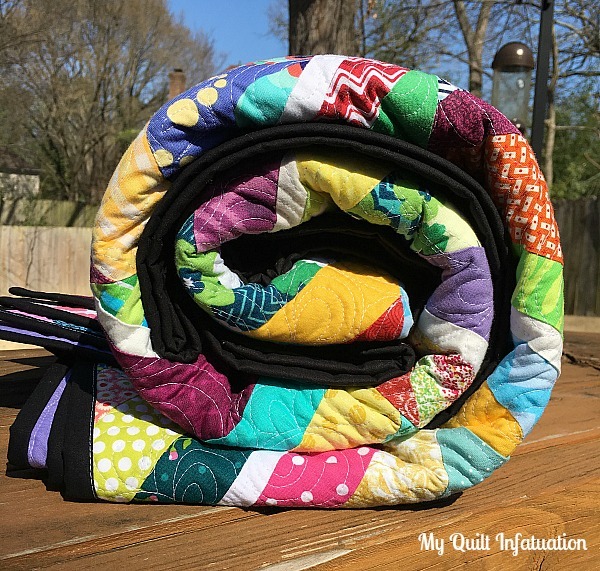 Though I have pulled from my scrap jars selectively for certain quilts, it's been awhile since I've busted them completely, so it was time to put them to use. 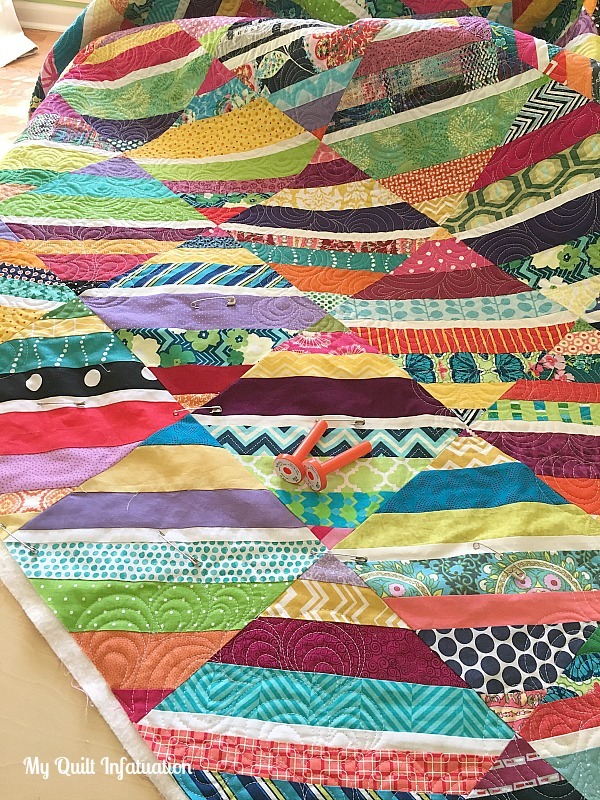 Scrap quilts are always my favorites, and the way this one is shaping up is definitely not disappointing. 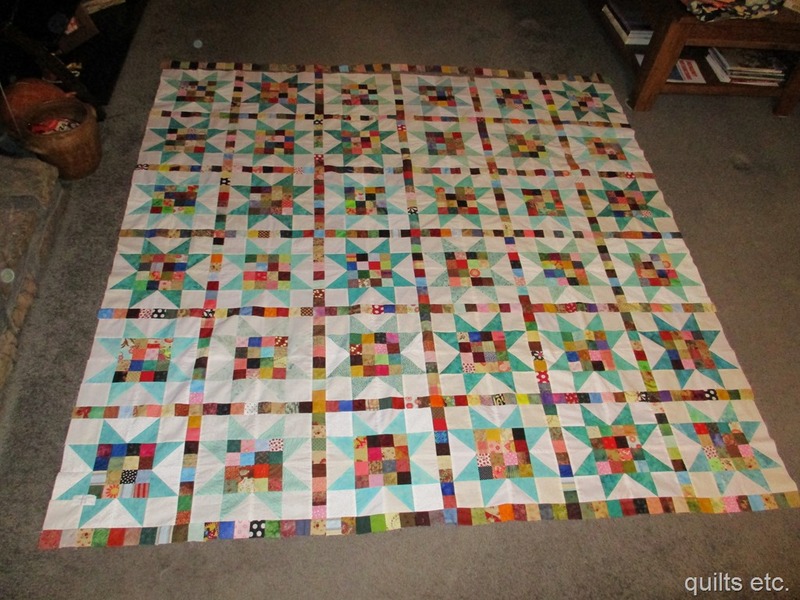 I can't wait to get it basted and quilted! And finally, this curved log cabin mini by Handwrought Quilts is so gorgeous. 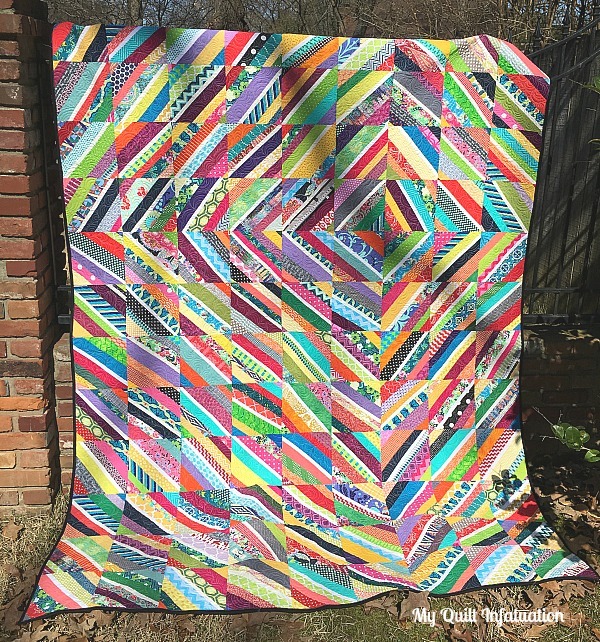 The shades of gray in the background really make the rainbow strips pop! Woohoo! Y'all rock! I always look forward to browsing the links each week, and I can't wait to see what you have going on. 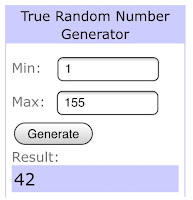 By the way, I have FOUR giveaways going on right now, as well as a few great coupon codes from my favorite shops, so be sure to hop over HERE to enter. Happy Valentine's Day, friends! What better day to shower yourself with fabric love! I've rounded up all of the latest happenings at my favorite shops, and several giveaways that you don't want to miss; so let's get down to business. I'm kicking off today's post with a biggie, y'all. You all know how much I love my custom quilt labels, right? 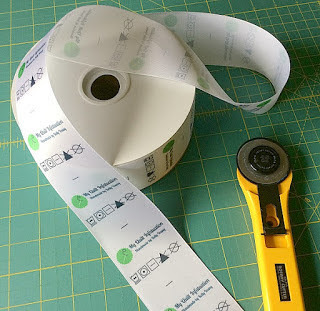 Well, Finer Ribbon is giving away a whole spool of these labels (1000 labels!) to one lucky reader- in any size you choose! 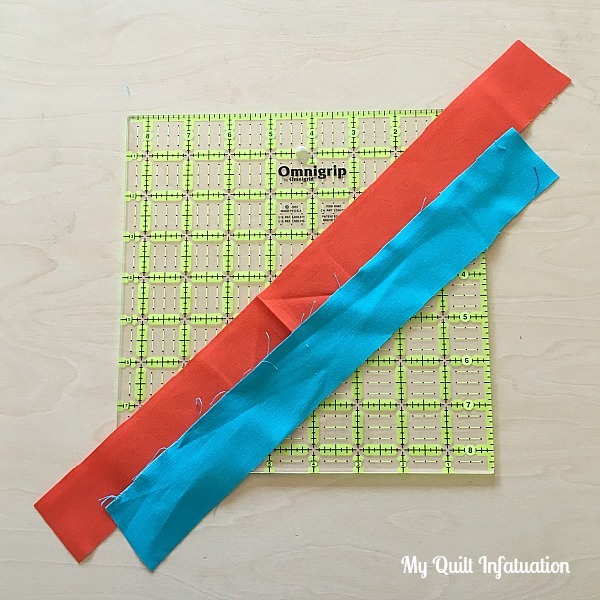 My labels are 2 1/4 inches wide, and perfect for sewing into the binding of quilts, minis, and pillows. This giveaway includes full color printing with ink that won't fade or bleed, and design help in making sure your design is exactly what you want. Labeling your projects absolutely could not be any easier or more professional. 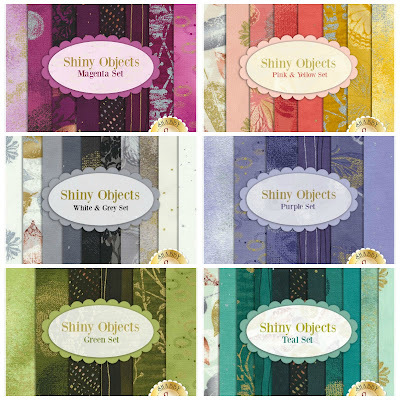 Up next is Shabby Fabrics, and oh boy, do they have some new drool-worthy collections in stock right now! 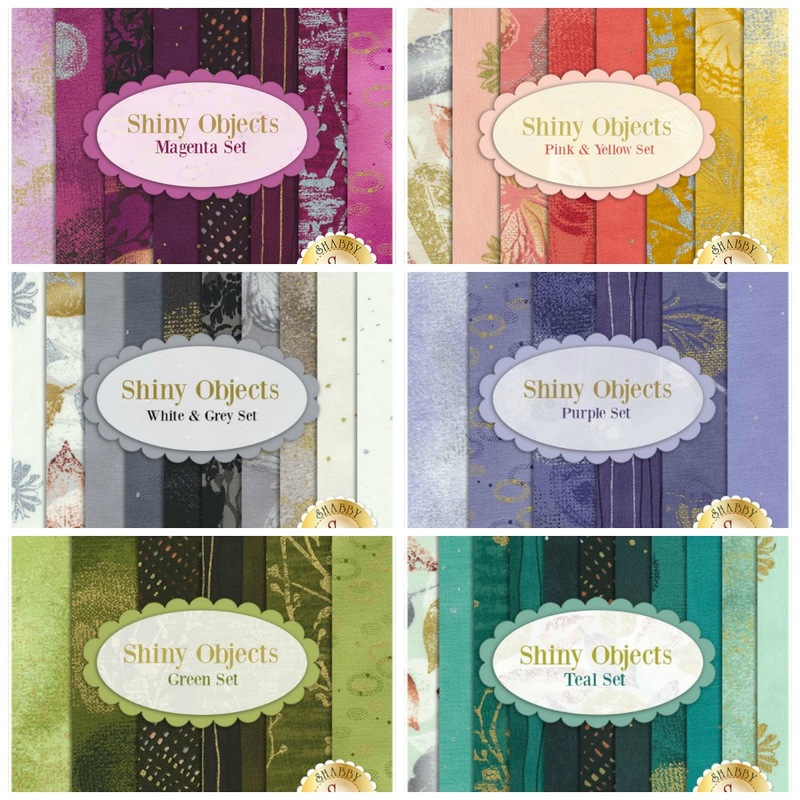 For all of you lovers of metallics, Shabby Fabrics has you covered with new fat quarter sets, as well as a couple of great kits. If your love is softer fabrics, they also have Robert Kaufman's brand new collection, Margeaux. This line is just too sweet! LouLou's Fabric Shop also boasts lots of new collections, just in time for spring. Yes, even though it is only mid-February, I am willing spring weather to go ahead and get here! Riley Blake's Rustic Elegance, and Moda's Spring Bunny are two very different collections, but both beautifully capture the warmth and freshness of the upcoming season. 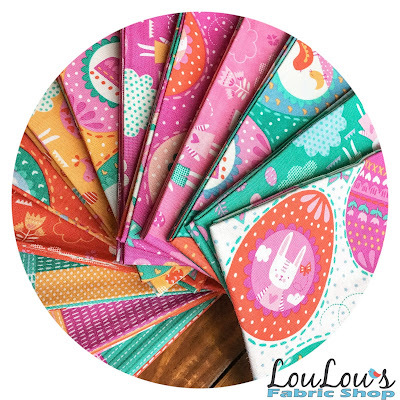 LouLou's is also sponsoring the second giveaway of the day! 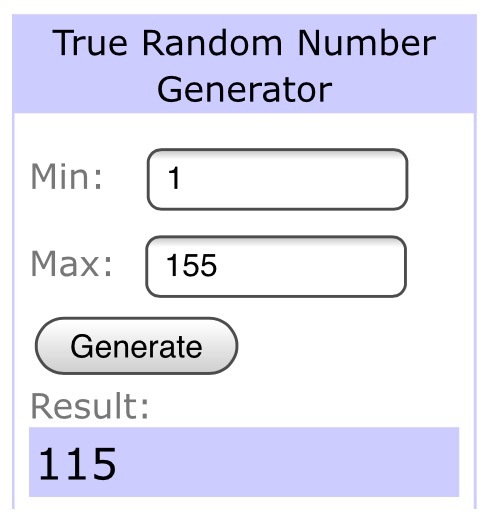 A $10 gift card to spend on anything in the shop! 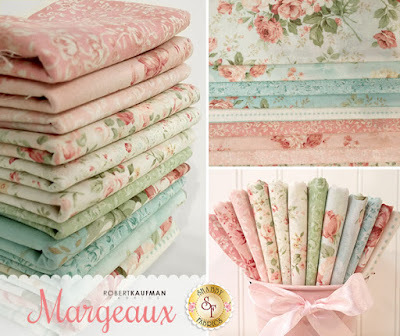 Lady Belle Fabric also has tons of awesomeness going on. Right now, clearance bundles are 40% off! Several other bundles are marked down 20-30% off, and brand new bundles are 15% off! That's tough to beat for sure. As if that wasn't enough, Lady Belle also has some sweet deals in their Sweetheart Shoppe, and you can get free shipping on any order with the code freeship! Lady Belle is sponsoring the next giveaway of the day, with a $25 gift card to spend however you choose! 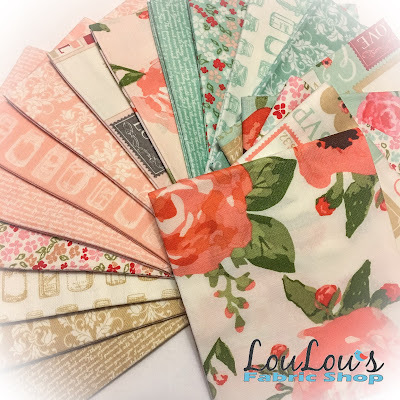 Rounding out my faves this month is Fort Worth Fabric Studio. Today and tomorrow only, FWFS is offering 14% off of all of the items in their House of Hearts section. Just use the code HEARTS14 to take advantage of this deal. 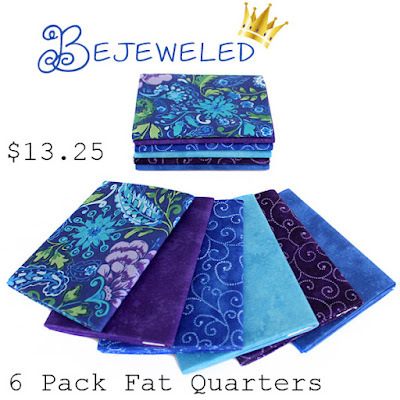 And as if that wasn't enough, Fort Worth Fabric Studio is sponsoring our final giveaway of the day- this gorgeous Bejeweled bundle with six perfectly coordinated fat quarters. Whew! What a whirlwind of fun! 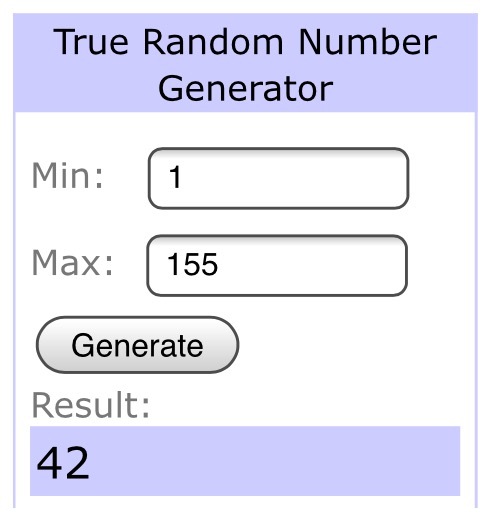 I know you all want to know how to enter these four amazing giveaways. Just leave a single comment on this post to enter all four giveaways, and since one of our giveaways is open to the continental US only, please let me know if you are not in the States! Don't worry though, you're still eligible for the other three prizes. Remember to leave an email address if you're a no-reply blogger, and only one entry per person please! 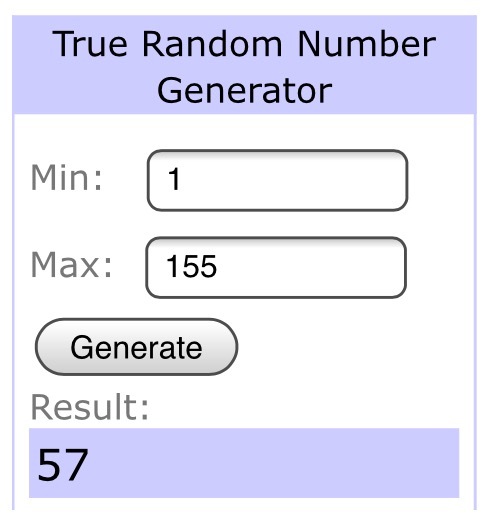 Unfortunately, replies to your own comment counts as an entry (the system numbers those, too), so remember to put your email address in your comment. Additional replies/comments/entries are always deleted. 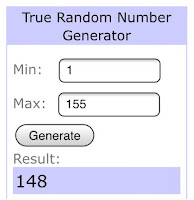 I'll announce the winners at NEXT week's NTT (February 21st). Happy shopping, and Happy Valentines Day! Happy Needle and Thread Thursday, friends! My parents came into town last weekend for a visit, and I finished my aunt's quilt, so that I could send it to Louisiana with them. 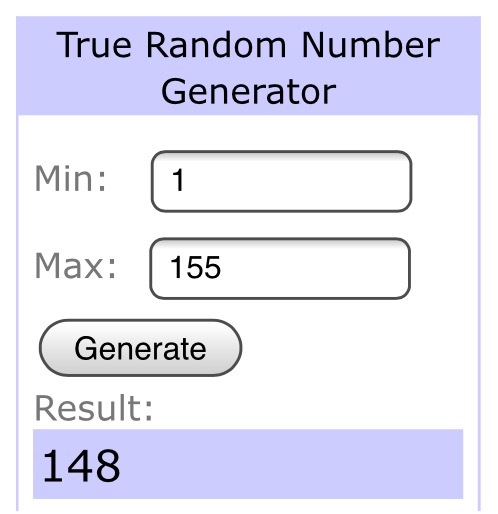 My aunt actually lives in Texas, but in a few weeks, my grandmother is taking a trip there, and the quilt will be passed off to its final destination. We relay things like this as often as we can, and it's always fun when it works out that we don't have to ship things. That meant that I had to finish this one up pretty quickly before my parents arrived, but it all worked out! 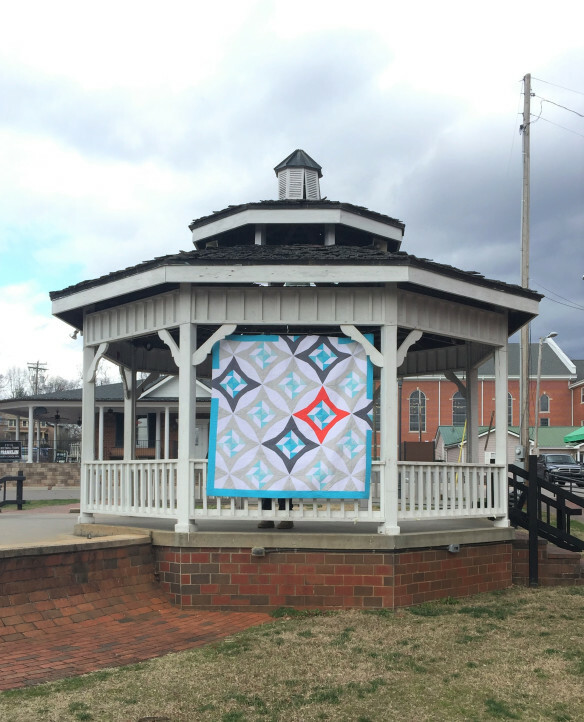 From a little bit of a distance, the quilt looks a bit busy, but because the colors are so calming, it still works. There are so many pretty prints in this one, and you can really see them so much better up close. 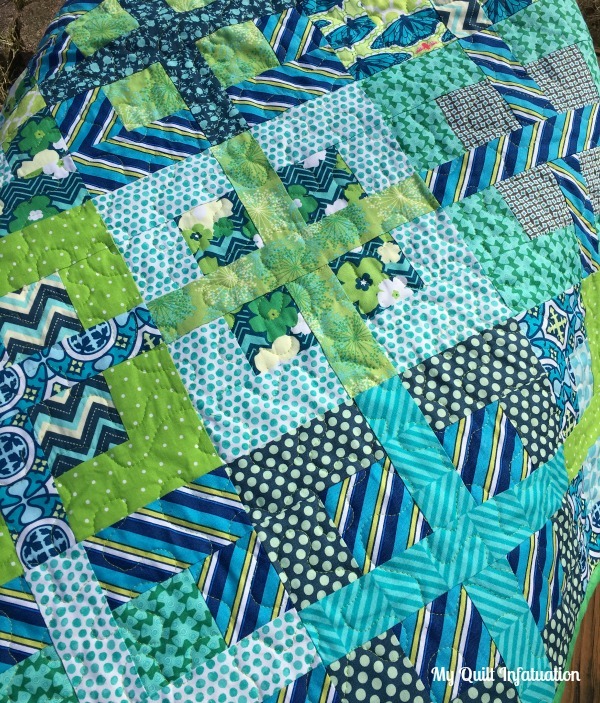 I used up all of the leftovers on the back, and decided on a clover green binding to finish it off. 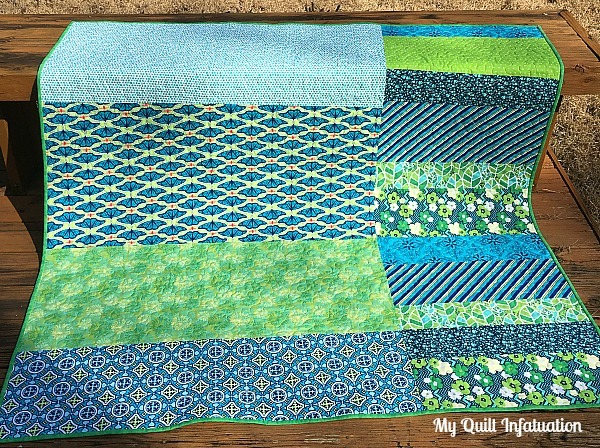 Blues and greens are so soothing, and I love how this quilt turned out. I decided to use the butterfly print as inspiration, and name it Butterfly Oasis. I don't usually choose prints with animals in them, but I was drawn to this one! Shall we get to last week's features? 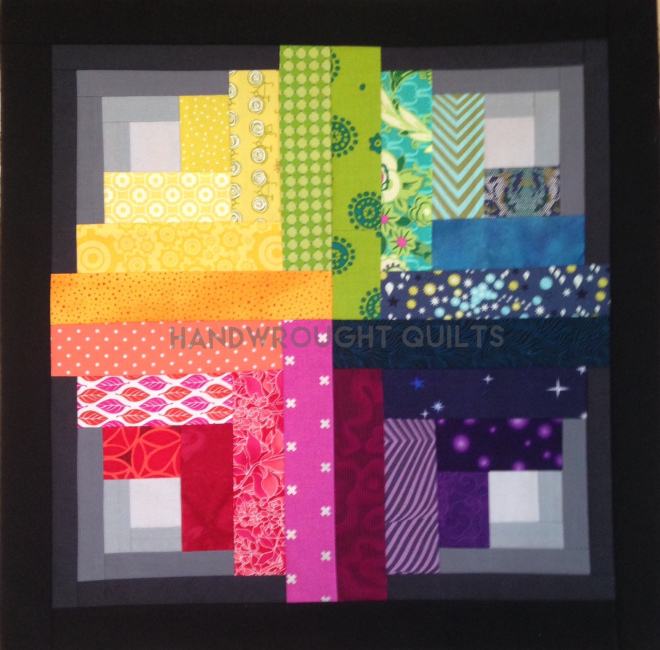 Teresa at a Quilt and a Prayer shared this scrappy rainbow masterpiece. So fun! 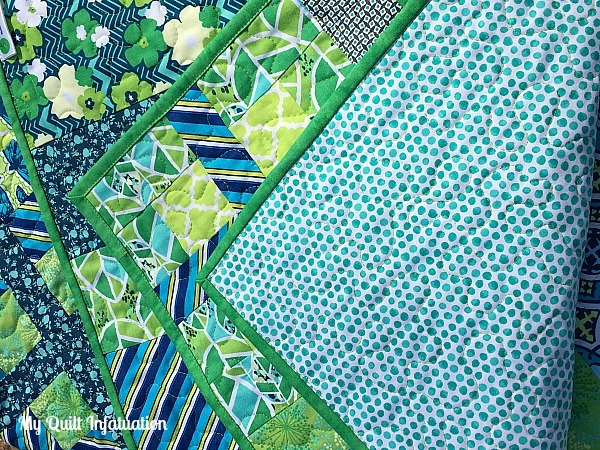 Tanya Quilts in CO shared Christmas patchwork Swoon quilt, along with a Swoon mini. 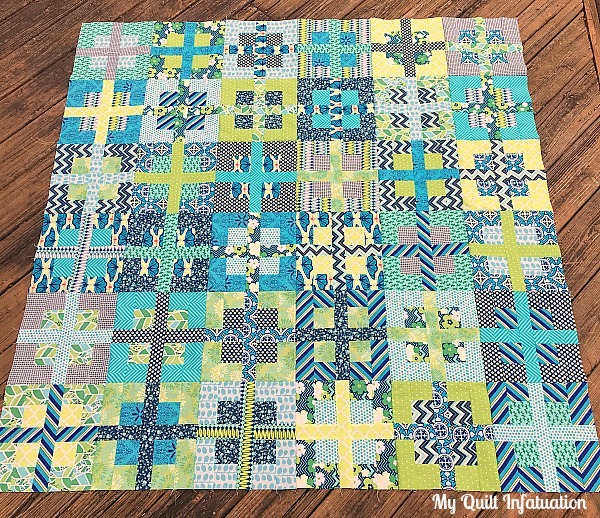 The patchwork variation is so unique, and I love that soft green background. 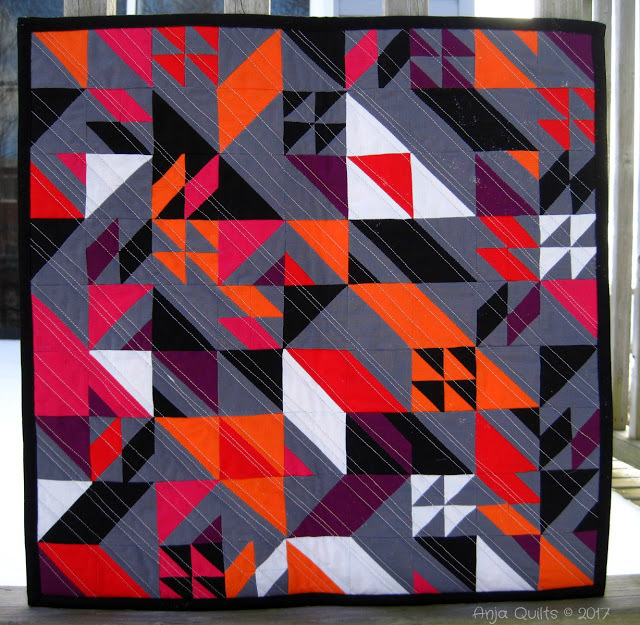 and this Flaming Star quilt by Monkey Needle is amazing! LOVE!! Y'all really rocked it out last week! Time to show me what you're working on this week. Let's link up, friends! Welcome to the downhill slide of another week, friends! I can't believe that a whole month of 2017 has already slipped by. I actually have a quilt I can share with you today. 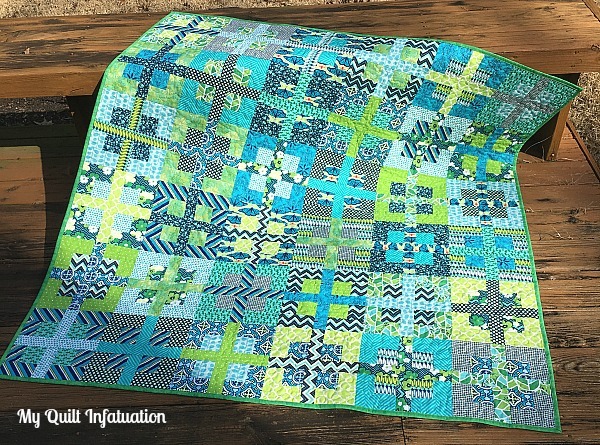 This quilt is for my aunt, who asked for shades of navy, green, aqua, and teal...aaand I just realized the quilt is sideways in the picture. oh well. 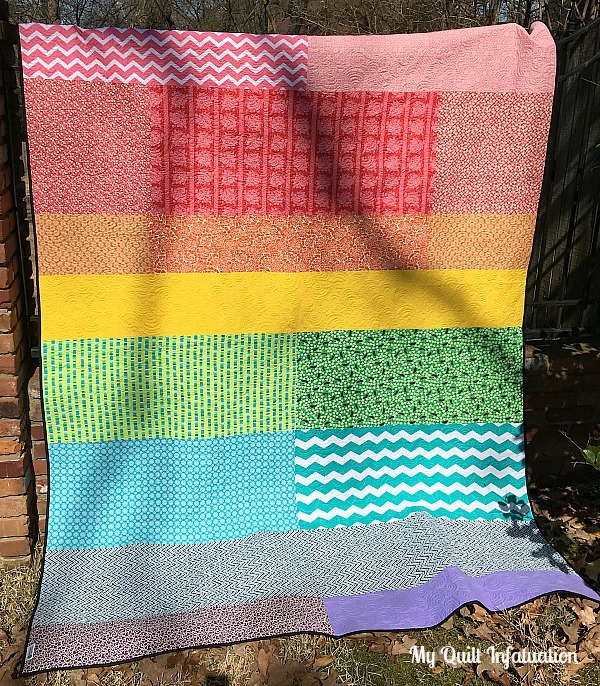 As you may already know, this is one of my very favorite color palettes, so it was a perfect fun project after having to sew to a deadline lately. 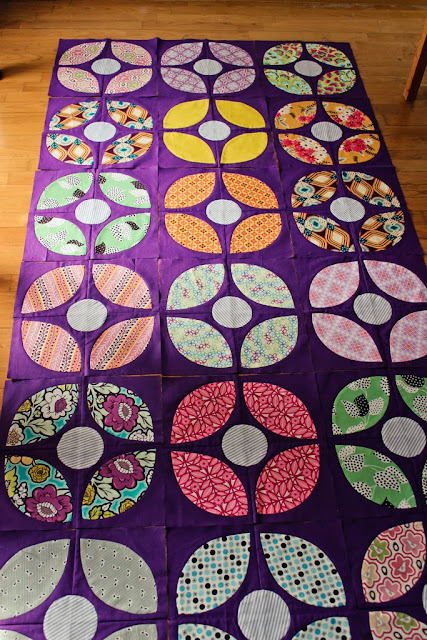 In case you're wondering, this is the same block that I used for my Sugar Plum Fairy quilt (also at my aunt's request), and the block tutorial can be found at the post HERE. Also, I feel compelled to say though this is a busier pattern, it is looking much busier in the photo than it does in person. I think the cool colors keep it from being too overwhelming, too. If I can manage it, this one is getting finished up tomorrow, so I can actually have a shareable Friday finish this week! Last week's party was full of awesomeness, as usual! 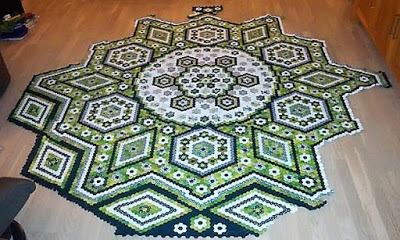 Just look at this hexie project in shades of green by Den syende himmel. 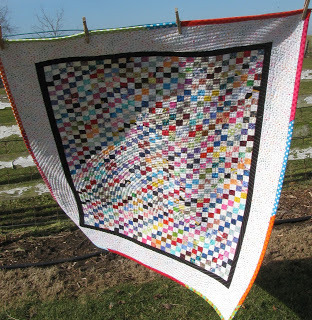 Oh my goodness- what a labor of love! 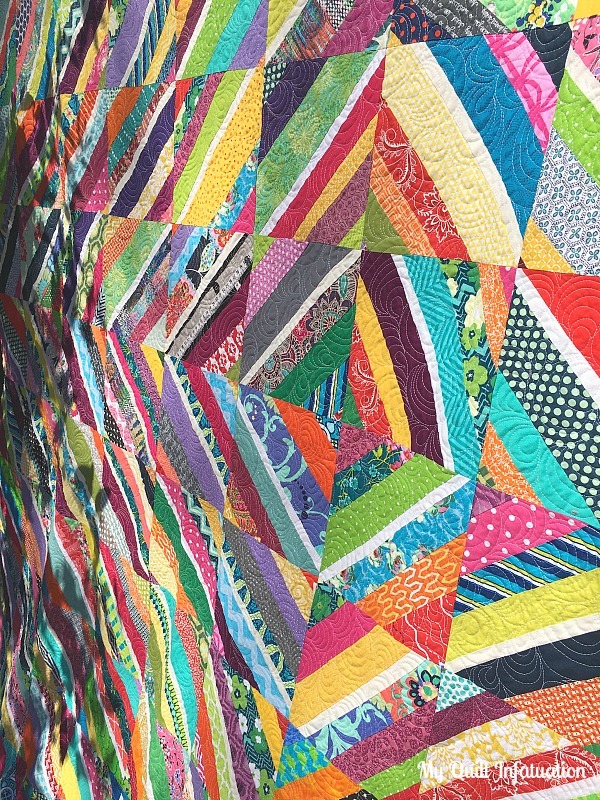 or this bright and fun postage stamp quilt by Gretchen's Little Corner. 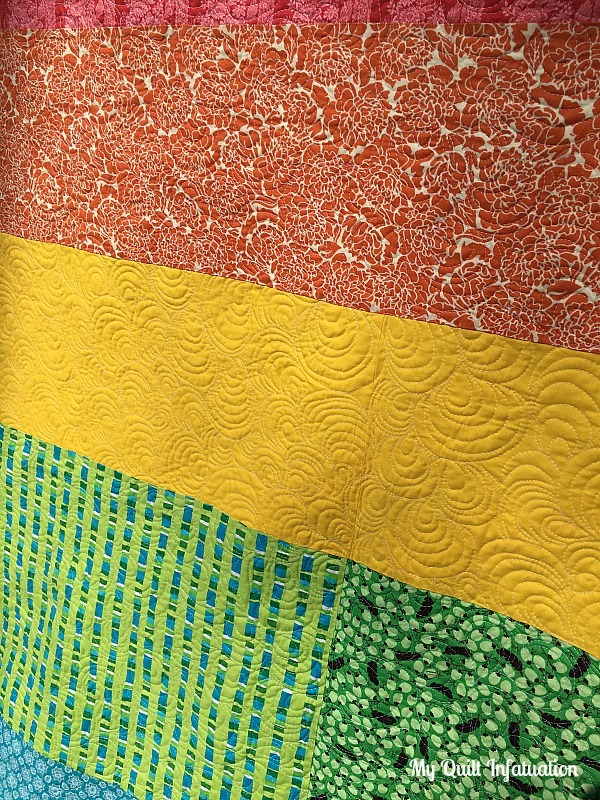 and this beautiful top from Quilting at the Farm. Wow!! Y'all finished out January with a bang! Time to show what you have going on this week. Let's party!